You can make perfectly spiced applesauce with zero preservatives and no refined sugars, right from the comfort of your kitchen. Making homemade applesauce from scratch is super easy: only five ingredients and a bit of prep and you’re done. 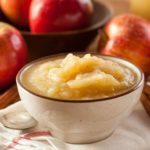 This flexible applesauce recipe can take on a variety of flavors depending on the apples you choose. Use Golden Delicious apples for a mellow flavor with a sweet finish. Try Honeycrisp apples for a subtly tart flavor or Gala apples for very sweet applesauce. This Applesauce recipe makes a great mid-morning pick me up or as a fun after-school snack. It also pairs well with our recipe for Grilled Pork Chops — try it tonight! This homemade Applesauce is ready in less than an hour. Place apples, water, cinnamon, lemon juice, and lemon peel in a large saucepan. Bring to a boil over medium heat. Reduce heat to low; gently boil, stirring occasionally, for 20 to 30 minutes, or until apples are soft. Remove lemon peel. Mash until applesauce is desired texture.